Business owners and homeowners are now going for surveillance systems which make use of IP security camera network. IP means internet protocol and such security cameras have been configured to make it possible to have wireless remote viewing over the internet. The initial versions of IP security cameras were almost the same with the simple web cameras. The LaView 12 1080P IP Camera Security System is a great example of IP security camera systems that you can find in the market today. Whom Is LaView 12 IP Simple Security Camera Product Designed For? The LaView 12 1080P IP Camera Security System is very easy to set up and running. There is a built-in power over Ethernet or POE which makes it possible to turn plug and play installation into a reality. The moment the IP security camera has been attached to the dedicate Cat5 cable, you can easily hook this up to the NVR. The camera system will then detect the specific camera out of the eight security cameras that are ready to be viewed automatically. Every IP security camera can relay video in full high definition 1080P which allows extremely clear and clean images. Each security camera has the capacity to see as much as 100 feet during night time. In a place where there is high degree of contrasting lighting, cameras will still be able to see clearly. It is because of the extensive dynamic range features that have been built into LaView IP security camera. It also comes with mobile apps which will let you access the video feed anywhere you are using your tablet, iPhone or other mobile devices. The IP security camera system also has the ability to record videos to a memory stick or cloud service. The standard setup of LaView 12 1080P IP includes eight security cameras with eight channels. There are also upgrades available to 12 cameras, with the number of channels double to as much as 16 if required. LaView provides a high end security camera system in the form of LV-KN988P86A4-T2. A single cat% cable runs from every IP camera straight to the NVR. It has phenomenal picture quality, full 1080p HD and every camera comes with 30 built-in LEDs which allow visibility of as much as 100 feet at night. it also has a dynamic range technology which allows better quality of viewing in mixed and high contrast lighting. This kind of low lighting and glare intense mixed environments is very common in car parks, corporate buildings, streets, isolated areas and factories. The system can offer one of the clearest footages that you can ever see if you are after high resolution clarity, provided that you are ready to pay for this. Of course, no one wants to have a low contrast, hard to make out and grainy footage during criminal proceedings or something that will only give unquestionable evidence. Also, you can set up some recording zones which will let you map out the stationary objects. This will record in motion alert mode and of course, you can also monitor things straight on your wireless devices. The app for LaView also makes it possible to view everything in real time. The plug n play CCTV system is also very easy and seamless to setup and provides the best in terms of visual performance. Its 3D dynamic noise reduction function can make the images much clearer under night vision mode through getting rid of artifacts and blemishes, thus making your footage sharper while improving playback. The DNR also gets rid off unclear specs in night vision so you can get sharper playback and monitoring performance. Aside from these, LaView also provides their customers with easy to follow tutorials. These can help you a lot when configuring the system, training you to make the most out of it. Reviews of this system were all fantastic as given by verified customers. The appreciation and confidence of this system given by the avid fans of CCTV give this product a solid backing. Question: What is the length of cable for each camera? Answer: Each of the cables measures 100 feet. Question: How many days can be recorded on 1080p at 30fps? Answer: Any recording at 1080p at 30fps for 24 hours will consume 2TB hard drive in around two weeks. The actual time of recording can change a lot depending on the environment and settings. Question: Is it possible to use the cameras outdoors? Answer: Yes, these cameras can be used outdoors. Question: What is the name of the app for mobile devices? Answer: It is called LaView Net. While there are reviews stating that there is no readily available documentation, a bit of research can help you find what you really need. Basic camera setup can also be done with the use of browser interface although some extra camera functions which are not available through this or other interfaces apart from the one on the camera directly. The camera can be installed in portrait or landscaped position and use per camera setup for rotating the image. The cameras has 81 degree view that can be too wide although turning the camera will be able to help. The LaView 12 1080P IP Camera Security System is proven to be a very dependable and dynamic home or business security solution. With its great features like full high definition and exceptional night vision, you can be sure that this will give the best bang for your buck. 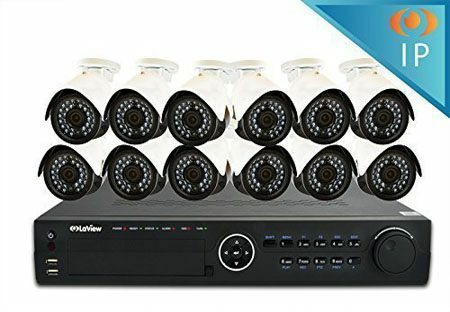 If you want to keep your home or business protected, then, better make sure that you get LaView 12 1080P IP Camera Security System today!